At the time of their twenty-fifth reunion in the year 2000, members of the Harvard Class of ’75 were uniquely poised to reflect on their first quarter century out of college, which happened to coincide with the last quarter century of the millennium. Published here with the participation of contributing graduates, independent of the university, these essays offer a fascinating perspective on life trajectories, changing mores, evolving priorities, and issues of race, class, and gender as seen and lived by graduates of one of the country’s premier universities. 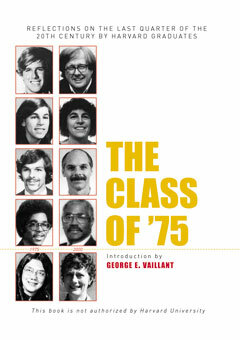 With a substantial analytic essay by Pulitzer Prize–winning Harvard psychiatrist Robert Coles, “before” and “after” photos, and fascinating data on career choices, marital choices, and avocational interests, The Class of ’75 will take its place next to Michael Medved’s What Really Happened to the Class of 65 and George Vaillant’s classic study of Harvard graduates, Adaptation to Life, as a seminal longitudinal look at a landmark era in the words of the people who lived through it. This book has not been authorized by Harvard University. George E. Vaillant is a professor of psychiatry at Harvard Medical School. He wrote the introduction to The Class of ’75: Reflections on the Last Quarter of the 20th Century by Harvard Graduates (The New Press).